'ONE OF THE FIRST POLITICAL CLASSICS OF THE 21st CENTURY'- Observer 'EXTRAORDINARILY POWERFUL, POIGNANT AND AFFECTING. 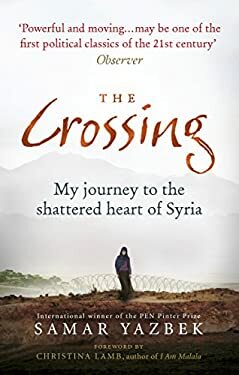 I WAS GREATLY MOVED' Michael Palin Samar Yazbek was well known in her native Syria as a writer and a journalist but, in 2011, she fell foul of the Assad regime and was forced to flee. Since then, determined to bear witness to the suffering of her people, she bravely revisited her homeland by squeezing through a hole in the fence on the Turkish border. In The Crossing, she testifies to the appalling reality that is Syria today. From the first innocent demonstrations for democracy, through the beginnings of the Free Syrian Army, to the arrival of ISIS, she offers remarkable snapshots of soldiers, children, ordinary men and women simply trying to stay alive...Some of these stories are of hardship and brutality that is hard to bear, but she also gives testimony to touches of humanity along the way: how people live under the gaze of a sniper...how principled young men try to resist orders from their military superiors...how children cope in the bunkers... Yazbek's portraits of life in Syria are very real, her prose is luminous. The Crossing is undoubtedly both an important historical document and a work of literature. New (22 available) BRAND NEW. Over 1.5 million happy customers. 100% money-back guarantee. Make your purchase count: support Better World Books' worldwide literacy partners.